Which command would be best to use on an unused switch port if a company adheres to the best practices as recommended by Cisco? A small company has a web server in the office that is accessible from the Internet. The IP address 192.168.10.15 is assigned to the web server. The network administrator is configuring the router so that external clients can access the web server over the Internet. Which item is required in the NAT configuration? 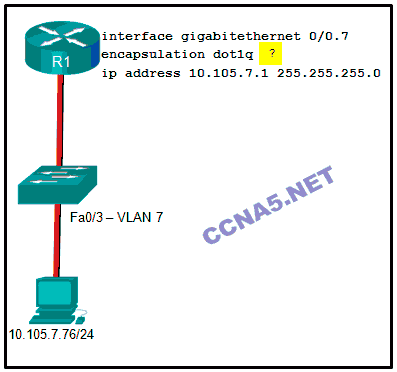 Which type of static route typically uses the distance parameter in the ip route global configuration command? Refer to the exhibit. What address will be used as the router ID for the OSPFv3 process? Refer to the exhibit. If the IP addresses of the default gateway router and the DNS server are correct, what is the configuration problem? The IP address of the default gateway router is not contained in the excluded address list. The DNS server and the default gateway router should be in the same subnet. A network administrator is testing IPv6 connectivity to a web server. The network administrator does not want any other host to connect to the web server except for the one test computer. Which type of IPv6 ACL could be used for this situation? What is an advantage of using dynamic routing protocols instead of static routing? 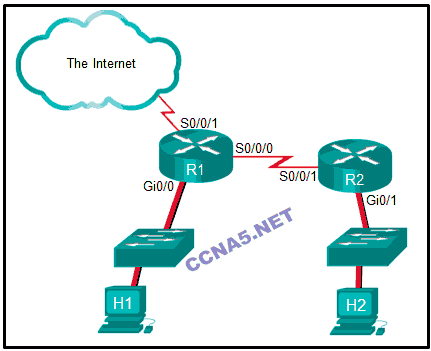 How many classful networks are summarized by the static summary route ip route 192.168.32.0 255.255.248.0 S0/0/0? Which switching method provides error-free data transmission? A client is using SLAAC to obtain an IPv6 address for its interface. 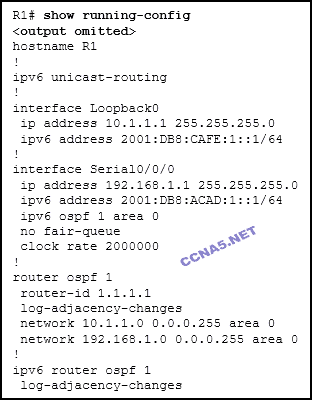 After an address has been generated and applied to the interface, what must the client do before it can begin to use this IPv6 address? It must send a DHCPv6 INFORMATION-REQUEST message to request the address of the DNS server. It must send a DHCPv6 REQUEST message to the DHCPv6 server to request permission to use this address. It must send an ICMPv6 Neighbor Solicitation message to ensure that the address is not already in use on the network. It must send an ICMPv6 Router Solicitation message to determine what default gateway it should use. Which network design may be recommended for a small campus site that consists of a single building with a few users? How is the router ID for an OSPFv3 router determined? Refer to the exhibit. In the routing table entry, what is the administrative distance? What does an OSPF area contain? Which command will create a static default route on R1 to send all traffic to the Internet and use serial 0/0 as the exit interface? What is a result of connecting two or more switches together? 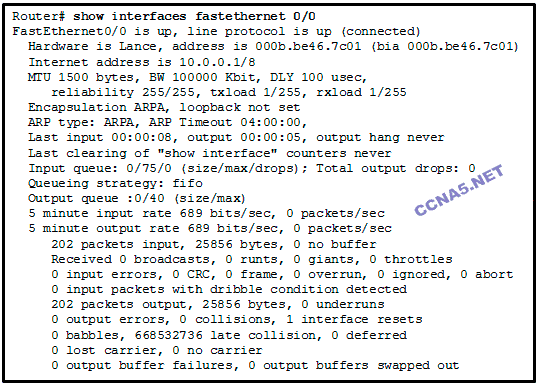 Which DHCP IPv4 message contains the following information? What is meant by the term “best match” when applied to the routing table lookup process? Refer to the exhibit. The student on the H1 computer continues to launch an extended ping with expanded packets at the student on the H2 computer. The school network administrator wants to stop this behavior, but still allow both students access to web-based computer assignments. What would be the best plan for the network administrator? Apply an inbound extended ACL on R1 Gi0/0. Apply an inbound standard ACL on R1 Gi0/0. Apply an outbound extended ACL on R1 S0/0/1. Apply an outbound standard ACL on R2 S0/0/1. Apply an inbound extended ACL on R2 Gi0/1. Refer to the exhibit. A network administrator is configuring inter-VLAN routing on a network. For now, only one VLAN is being used, but more will be added soon. What is the missing parameter that is shown as the highlighted question mark in the graphic? It identifies the number of hosts that are allowed on the interface. It identifies the native VLAN number. It identifies the VLAN number. It identifies the type of encapsulation that is used. Layers minimize the number of devices on any one tier that share a single point of failure. Each layer has specific rotes and functions that can scale easily. Which command will verify the status of both the physical and the virtual interfaces on a switch? Refer to the exhibit. Which would be chosen as the router ID of R2? The router ID has to be manually configured. A router with two LAN interfaces, two WAN interfaces, and one configured loopback interface is operating with OSPF as its routing protocol. 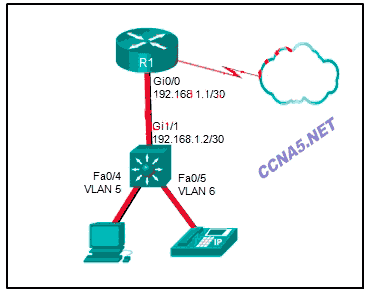 What does the router OSPF process use to assign the router ID? The (duplex full, DUPLEX FULL) command configures a switch port to operate in the full-duplex mode. Refer to the exhibit. R1 and R2 are OSPFv3 neighbors. Which address would R1 use as the next hop for packets that are destined for the Internet? In a routing table which route can never be an ultimate route? Refer to the exhibit. Host A has sent a packet to host B. What will be the source MAC and IP addresses on the packet when it arrives at host B? 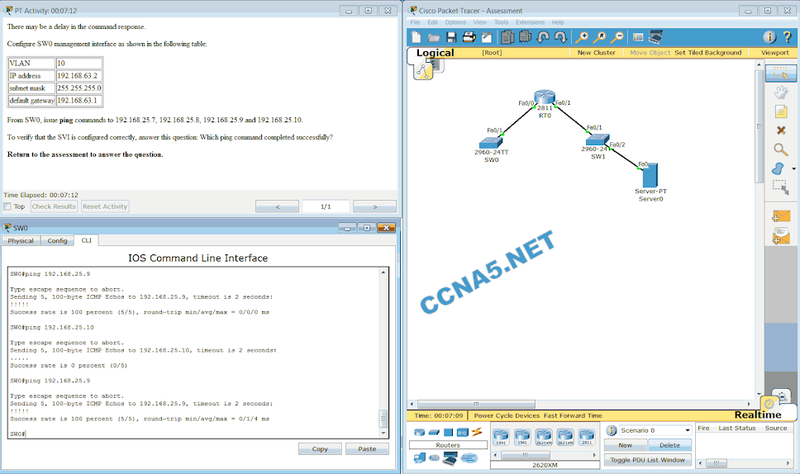 What is the effect of entering the network 192.168.10.1 0.0.0.0 area 0 command in router configuration mode? OSPF advertisements will include the network on the interface with the IPv4 address 192.168.10.1. An administrator is trying to remove configurations from a switch. After using the command erase startup-config and reloading the switch, the administrator finds that VLANs 10 and 100 still exist on the switch. Why were these VLANs not removed? Because these VLANs are stored in a file that is called vlan.dat that is located in flash memory, this file must be manually deleted. What is a disadvantage when both sides of a communication use PAT? Host IPv4 addressing is complicated. The flexibility of connections to the Internet is reduced. The security of the communication is negatively impacted. What is associated with link-state routing protocols? When does a switch use frame filtering? The destination MAC address is for a host with no entry in the MAC address table. The destination MAC address is for a host on a network supported by a different router. The destination MAC address is for a host on a different network segment from the source of the traffic. The destination MAC address is for a host on the same network segment as the source of the traffic. An administrator created and applied an outbound Telnet extended ACL on a router to prevent router-initiated Telnet sessions. What is a consequence of this configuration? 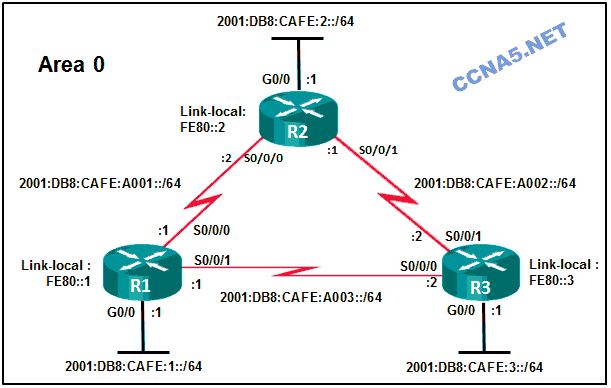 The ACL will not work as desired because an outbound ACL cannot block router-initiated traffic. The ACL will work as desired as long as it is applied to the correct interface. Disable and re-enable IPv4 routing. Shut down and re-enable the loopback interface. Clear the IPv6 OSPF process. Router-on-a-stick requires multiple physical interfaces on a router. A dedicated router is required. Multiple subinterfaces may impact the traffic flow speed. Router-on-a-stick requires subinterfaces to be configured on the same subnets. 51. Refer to the exhibit. R1 was configured with the static route command ip route 209.165.200.224 255.255.255.224 S0/0/0 and consequently users on network 172.16.0.0/16 are unable to reach resources on the Internet. 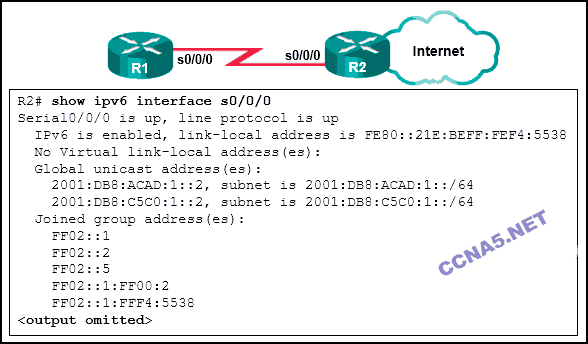 How should this static route be changed to allow user traffic from the LAN to reach the Internet? Configure SSH for remote management. 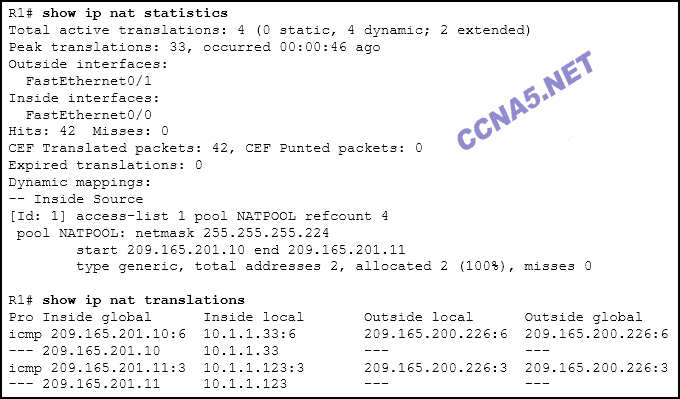 Configure the native VLAN to match the default VLAN. 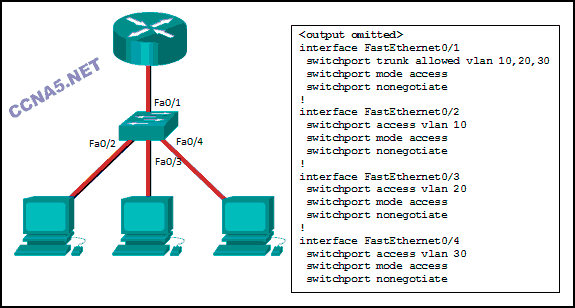 Configure specific ports for management traffic on a specific VLAN. Three addresses from the NAT pool are being used by hosts. The name of the NAT pool is refCount. A standard access list numbered 1 was used as part of the configuration process. Two types of NAT are enabled. One port on the router is not participating in the address translation. 54. Refer to the exhibit. 55. What best describes the operation of distance vector routing protocols? The path a static route uses to send data is known. No intervention is required to maintain changing route information. Static routing does not advertise over the network, thus providing better security. Static routing typically uses less network bandwidth and fewer CPU operations than dynamic routing does. Configuration of static routes is error-free. Static routes scale well as the network grows. 58. Which characteristic is unique to EIGRP? EIGRP supports both IPv4 and IPv6. EIGRP supports unequal-cost load balancing. 59. A network administrator is implementing a distance vector routing protocol between neighbors on the network. In the context of distance vector protocols, what is a neighbor?